On May 4, the City of Oakland celebrates its birthday and kicks off Small Business Week. Please join us for the Celebrating 163 Years of Business Growth in Oakland Reception on Monday, May 4, from 5:30-7:00pm in Oakland City Hall. The reception will celebrate local businesses that have made long term commitments to our city. Four Oakland businesses will be honored that evening for their legacy contributions to the city and its economy: Piedmont Grocery (114 years), American Brass & Iron Foundry (109 years), East Bay Restaurant Supply Company (81 years) and Peerless Coffee & Tea (91 years). Small Business Week features workshops and resource fairs to help Oakland businesses thrive. See the Upcoming Events sidebar. Lake Merritt’s east side is popping with new businesses. 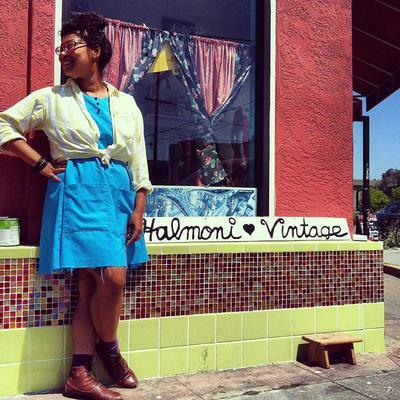 We asked Natasha Harden, owner of Halmoni Vintage, to tell us about her Eastlake neighborhood. “The Park Boulevard microhood includes local businesses like Baggy's, Woody's Cafe & Laundromat, Parkway Lounge, Lost Salon, Donaire Sr. Boxing & Fitness and many more. The newest edition to the neighborhood is an acupuncture clinic and yoga studio called Remedy, just down the block from The Perfect Sidekick.” She adds, “If you want to get some shopping and people watching in, then Second Avenue is where it's at." Located between Foothill and East 16th, the street includes Halmoni Vintage, Five and Dime Tattoo, Pietisserie, Akat Cafe Kalli, Portal Beer Garden & Restaurant, Rockin' Crawfish and SKYLMT, all just one block away from lovely Lake Merritt. Halmoni Vintage doubles as a community hub by hosting events, including the bi-monthly A Naked Lady Soiree, a body positive clothing swap. For more information on neighborhood retail opportunities in Oakland, please contact Retail Specialist Keira Williams. 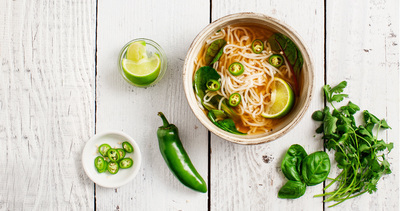 Nona Lim, an artisan food manufacturer of ready-to-heat soups and entrees, is proud to have built her eponymous business in West Oakland near a hub of other artisan food manufacturers and across the street from City Slicker Farms’ community market farm. In 2010, Ms. Lim signed a lease at 3310 Peralta Street, which was historically the multi-purpose building of Clawson Elementary School. With the help of a $45,000 City of Oakland tenant improvement grant, Ms. Lim converted this space into a 3,000-square-foot commercial kitchen facility to produce “real, simple, delicious” soups and noodles. This year, the building received another upgrade with a façade grant from the City that helped to fund new landscaping and fresh paint. For more information on West Oakland’s commercial façade improvement grant program, please contact Hui-Chang Li with the Project Implementation Division. 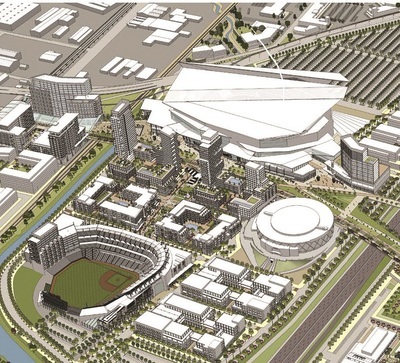 On April 21, 2015, Oakland City Council adopted the Coliseum Area Specific Plan and EIR. The Plan includes new zoning regulations for the 800-acre area that support the Plan's vision: new sports venues, entertainment, housing, office space and open space in a regionally significant jobs and employment area. The Council-approved zoning enables the future development envisioned in the Plan, while preserving the Oakland Airport Business Park’s current thriving industrial and commercial uses. With adoption of the Plan, the City establishes a development program to retain the three professional sports teams in new facilities and encourage the construction of new mixed-use development at a major transportation hub. For more information, please contact project manager Devan Reiff, City of Oakland, 510-238-3550, or see the Project website. The City's Planning and Building Department is making the permitting process easier and more transparent. Business owners and residents can now use the City’s website to search planning and building records, schedule inspections and file complaints. In addition to the new Citizens’ Portal, the City’s online interactive Zoning Map provides planning and zoning information for each parcel. Look for more online services including online payments to be added later this year! For more information, please contact Development Planning Manager Robert Merkamp. Oakland businesses interested in engaging and hiring local youth are encouraged to check out Classrooms2Careers, a fresh approach to youth employment. A collaboration between Mayor Libby Schaaf and the Oakland Workforce Investment Board, the program offers opportunities ranging from classroom presentations by industry professionals to paid student internships. The goal is to help young people prepare for college and careers by offering meaningful work that builds real world skills and experience. “It’s a great opportunity for employers to identify talent and access promising candidates,” said John Bailey, Workforce Investment Board executive director. Employers who want to connect with Oakland’s young people can attend the Oakland Youth Career Expo on May 21 from 9am to 2pm at Jam Town, 21 Fourth Street, or contact Workforce Development specialist Tamara Walker. Take Our Survey on Economic Development in Oakland! Oakland Museum Exhibit asks, Who is Oakland?